This article is about the mythological conch. For the RSS publication, see Panchjanya (magazine). For ancient people, see Pancha-janah. Panchajanya (IAST: pāñcajanya) is the Shankha or conch of the Hindu god Vishnu. According to the Ramayana, Purushottama (Vishnu) killed a Danava (demon) named Panchajana on a mountain named Chakravan constructed by Vishwakarma and took away the conch shell in which Panchajanya had lived. The conch was named after the Danava. As per the Harivamsa, Krishna, the avatar of Vishnu, is described as possessing a conch shell called Panchajanya, one of his four attributes together with the mace Kaumodaki, the disc-like weapon Sudarshana Chakra and a lotus flower. The conch was used during the Kurukshetra War. Panchajanya or Shankhasur was an evil sea demon who lived in a colossal conch shell in the deepest depths of the Prabhasa ocean or was a demon in the form of a conch shell. He kidnapped the son of Sandipani, the guru of Shri Krishna, Balarama, Sudama,and Uddhava and imprisoned him in the conch shell. Upon completion of their studies, Krishna, Balarama, and Uddhava persuaded the teacher to ask for the preceptor’s dakshina (fees) of his liking. Sandipani asked for, as his dakshina, the restoration of his child. Krishna became enraged when he heard about the kidnap and plunged into the sea to rescue the son of Sandipani. Krishna successfully slew Shankhasur and took the conch shell for himself. He then went to his guru Sandipani who named that conch as Panchjanya .Whenever Krishna blows from the shell it foreshadows the death of his next opponent. The great war of the Mahabharata began after blowing Panchjanya by Lord Krishna. 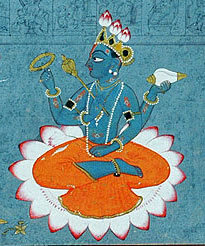 Vishnu is said to be quad-armed and he is depicted holding in one of his hands the panchajanya conch, which, like other shastras, has been transferred to lord Krishna on earth from the so-called heaven- Vaikuntha dhama. Lord Krishna found him in a deep sea. A demon used to sleep in this conch and thus was destined to be killed by holy god, at the time of receiving the conch. ^ or "in another universe" When Lord Buddha achieved enlightenment, he saw millions and millions of “chakravan” or cosmoses, all repeatedly coming into existence, lasting for a while, and then disintegrating. Thepyanmongkol, Phra (2007). Sunday Dhamma Talks, volume 1. Ratchaburi Province, Thailand: Wat Luang Phor Sodh Buddhist Meditation Institute. p. 29. This page was last edited on 11 April 2019, at 01:52 (UTC).